Get ready to meet one of the most versatile, convenient, and powerful vapes on the market. Take back control of your vaping experience and customize it with the Sidekick Vaporizer. The Sidekick Vaporizer is designed to bring you ultimate convenience, so it's equipped with a stirring mechanism that sits over the chamber and lets you stir your material throughout your session without ever taking off the lid. This means that your herbs will heat as evenly as possible for the duration of your session, there will be no hot spots during the incredibly cool convection or conduction heating process. Using a high quality stainless steel inner plate and screen, the Sidekick Vape's stirring apparatus is durable, and, of course, effective. Placed perfectly for easy use on this ergonomically designed vape, the stirring tool works with just a quick push of your thumb. 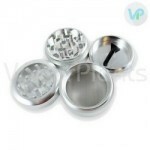 Spin it around as you vape to keep the dry herbs moving so they are heated evenly. 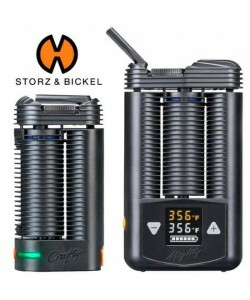 This conduction-convection herb vape includes 21 heat settings ranging from 100 to 455 degrees Fahrenheit, which you choose using the digital display. In order to give it the best vapor quality, the creators at 7th Floor made a groundbreaking vortex vapor path insert to complement the many heat settings. This insert puts more distance between the ceramic heating element and chamber, which can hold up to .25 grams, to the mouthpiece, extending the path from 7 inches to 18 inches. The longer travel time means that the vapor has plenty of time to cool down from your chosen heat level, no matter how high, before it reaches the mouthpiece, which takes away harsh hits for good! This vortex piece can even be put into the freezer for incredibly cool vapor or removed and kept out entirely for a more freely flowing hit. Known for their hand blown glass accessories, 7th floor has implemented that know-how into the Sidekick dry herb vaporizer, as well. This herbal vaporizer comes with a high quality and handmade glass mouthpiece. As you surely know, glass used in vaping causes the vapor to remain pure, flavorful, and crisp. The glass mouthpiece here delivers unmatched flavor without it being tainted by the taste of stainless steel, plastic, or silicone. The glass mouthpiece is stored inside of the device itself and slides out easily when you are ready to use it. You may also replace the mouthpiece with a bubble attachment for even greater diffusion through a water filtration system. One of the best vaporizers - Review by Reba T.
The SideKick vaporizer is one of the best vapes I have ever purchased. SideKick Rocks - Review by Alan W.
I am someone who uses my vaporizer for medical reasons, so I can't have something that is too harsh or else I will choke and cough. I love that the SideKick vape is as smooth as it is and it has taken me several tries to find the right one to deliver such smooth vapor. It doesn't require taking deep long draws from it in order to only get a little bit of vapor so it's even more pleasant. Definitely my new favorite vape. Price a bit high - Review by Delia J.
I definitely do not regret my purchase. The price might be a bit high, but SideKick vape really outdid my expectations. Tastes great - Review by Carlos K.
It gives me good potent clouds when I want them and smaller ones when I am out in public and do not want to blow my cover. This SideKick vaporizer also has a nice glass vapor path, which I have noticed keeps the flavor tasting great. The best - Review by John L.
I have had a number of other vaporizers but this one is the best that I have tried. Very simple - Review by Sharon J.
SideKick is super sleek and compact, makes it simple for me to carry around with me. The vapor that it gives off is really smooth and comfortable and allows me to take as big of a hit as I want. The best vaporizer - Review by Stanley K.
The SideKick Vaporizer is the best vape I have used. Favorite - Review by Sue L.
The SideKick vaporizer is one of the ones that I always turn to when I need to vape. It might be my absolute favorite in my collection. Worth the price - Review by Mona P.
This vape is certainly worth its price. It is easy to carry around with me anywhere. 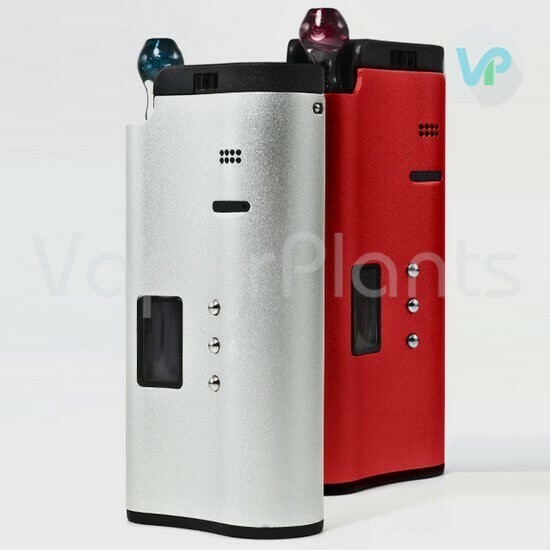 No smell - Review by Shamika R.
I like that it does not give off an obvious smell like a lot of other vaporizers of its kind do so that I can take it with me in public. It is also ideal for discreet vaping at home since I live with my family who does not want to smell it. No herbal waste - Review by Esther G.
The hits are smooth and SideKick does not waste any of my material, which in turn does not waste my money. Big boy - Review by Edward N.
I really couldn't have asked for anything better in terms of a vaporizer, except for it to be smaller and lighter. Dense clouds - Review by Bradley S.
SideKick vaporizer gets the job done for sure. The clouds are decent and they are dense. The flavor is great and exactly what I would expect from a vape of this price. It is great that the smell is low as well. Great purchase - Review by Bradley M.
The SideKick Vaporizer is something I was skeptical about buying at first because of the price, but I am so glad that I did. Satisfying and fulfilling - Review by Mildred R.
SideKick provides great clouds that are satisfying and fulfilling without giving off a lot of bad smell that makes it obvious what I am doing in public. Large chamber - Review by Elizabeth G.
This vaporizer is good for taking with me anywhere, not only because it has a large chamber, but also because the battery stays working for a really long time. Great design - Review by Helen M.
It does not take long at all for me to charge the SideKick vaporizer, great design and quality!